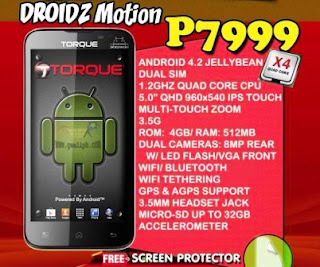 Its already been six months waiting for Torque DROIDZ Motion to be released, fortunately a Torque Social Media Officer emailed me that they will release Torque DROIDZ Motion this month of July. I have listed a few specs of Torque DROIDZ Motion but I'm not pretty sure if its 100% accurate, all we can have for now are just predictions of price and specs. Somehow it is been rumored to be 5.3inch IPS display with a 5 point multitouch touchscreen, and a whooping 16million colors display much like an Apple iphone phone. Estimated price for Torque DROIDZ Motion will be Php6,999. My wild guess that Torque DROIDZ Motion will also be Quad-Core, moreover I have collected a few possible specs of Torque DROIDZ Motion. Priced at Php7,999 Official SRP | Available now nationwide. Pahingi po ng link ng stock rom ng droidz motion..